Have I ever mentioned in writing for this site that I love making new musical discoveries? Probably. But let me re-affirm it: I love it. You can never have too much music. Although Bob Geldof would rather you part with your money (or that other well-known phrase) to make the world a more habitable place for more people…by making music. 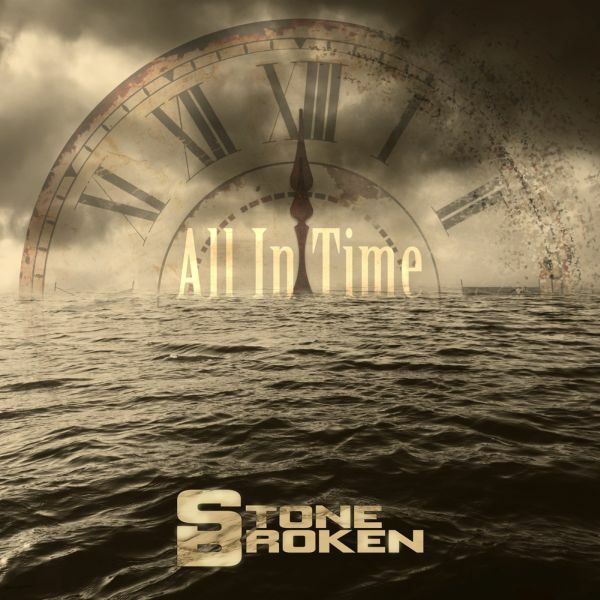 Cynical digression aside, Stone Broken have unleashed their debut album, All in Time. And like a snarling beast, they want to be set loose on the world. It’s a big, chunky, steaming serving of modern hard rock with the odd melodic part thrown in to keep things fresh. The belief in their own music is blindingly obvious and is sure to do them no end of favours. They know they have a good album on their hands. Originally conceived as a second EP, All in Time is essentially two EPs bolted together. So if you already know their work, only a handful of songs will be completely new. The existing ones have been remixed to sound more cohesive with the fresh material. With Rich Moss providing the gravelly, snarling vocals, you can almost imagine the Elvis Presley lip curl as he belts out the lyrics. Yet I’d be willing to bet if you listened to this blind, you’d be forgiven for thinking Tyler Connolly was singing. And with the crunchy riffs on offer from Chris Davis, you’ve got a very Theory of a Deadman-sounding band. Although the lyrics are a bit more mature. Neither of which is a bad thing, I may add. Theory of a Deadman are a great band and if that’s where they draw influences from, then more power to them. It could be worse; it could be Bring Me the Horizon. But then I wouldn’t be recommending you this album. Meanwhile, filling out the rhythm section is Robyn Haycock on drums and Kieron Conroy on bass. Haycock doesn’t over-complicate matters, keeping this relatively simple but she puts her tub-thumping skills to effective use. With solid rhythms, you’ll be nodding your head along to the pair of them in no time. Featuring ten tracks and none clocking in above the four and a half minute mark (alright, there’s one at 4 minutes 36 seconds if you’re being pedantic), combined with its straight-forward hard rock sound, the album will have played its final chords before you’ve had the chance to blink. Always the mark of a good album. Each song blends nicely into the next one, hitting the usual formula of peaks and valleys as some songs drop a couple of gears. After several listens, All in Time just gets better and it started itself off on great footing. The craftsmanship gone into the album from all aspects will hit you in the face from beginning to end and as I already stated, Stone Broken are more than well aware of how good it is.